Ahh, the darling of Kickstarter. 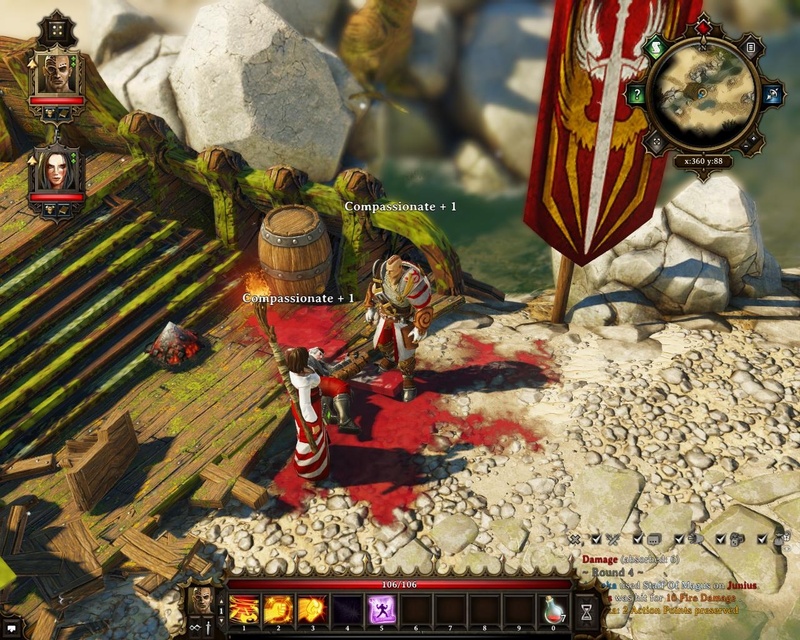 I didn’t back Divinity: Original Sin, because while I’ve enjoyed many previous Divinity titles I’m also extremely risk-averse and scared of new approaches to life. I mean, what if they made a game I didn’t like? Or worse: what if it would have been my input that made it bad? Artists, I think, are best left to their own devices, and as a consumer I feel better making an informed purchase (or not) of a finished work. Crowd-funding might be an excellent way to gather cash up-front for things that seem too risky to a giant publisher (even though there is actually a huge audience hiding under the quilt), but I’m not sure that crowds are entirely trustworthy in some other matters. Either way, the game got funded and got made without my intervention. Did the crowd impart its wisdom or did Larian make a belter despite its howling? Does the presence or absence of crowd intervention even matter? 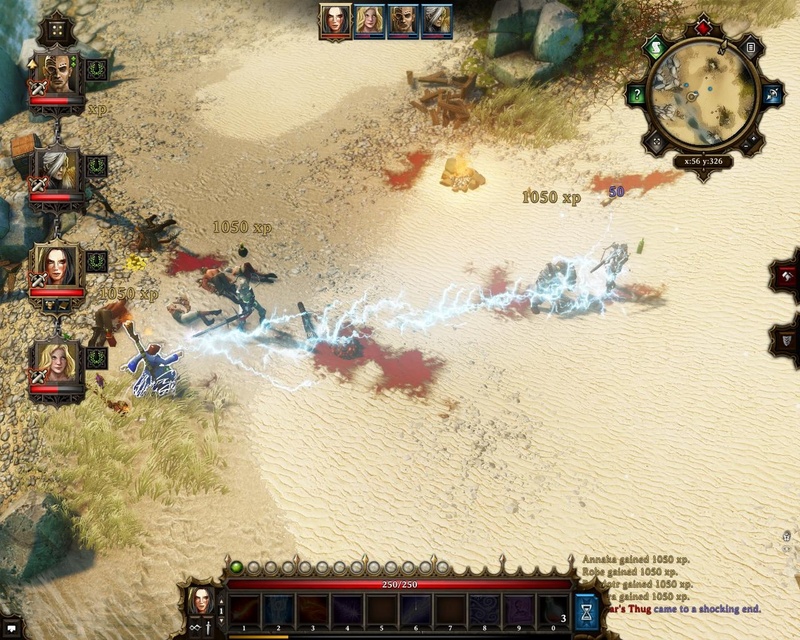 Divinity: Original Sin is a trip right back to Divine Divinity. 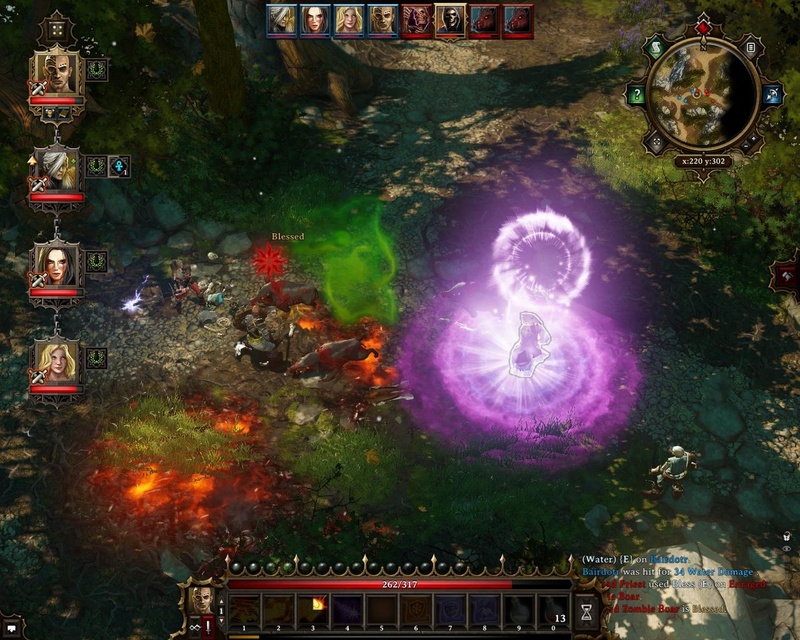 Despite that starting point so long ago, Larian seem to have spent the intervening years making everything except action/tactical RPGs — Divinity II was a third-person hack ‘n’ slash, Dragon Commander was a strategy game with the occasional bout of being a dragon… Excellent games, yes, but long strayed from the franchise’s roots. On starting Original Sin, though, it all came flooding back. Thankfully, they have built on the fabulous creature designs of Divinity II rather than the very traditional-looking original. It’s not just a throwback, though; Original Sin is a definite Step Forward, picking up right where we left off all those years ago and running forwards from there. I complained about the slightly confused action/tactical mechanics of the first two games before, so it’s reassuring that Original Sin is a completely turn-based game. When a fight starts, every character lines up in order of initiative and has some action points to use when their slot comes around — no messy hybridisation of strategic pausing and manual attacking. Fights are equal parts overblown hilarity and nailbiting frustrating. The elemental magic system is absolutely sublime — summon clouds of poison on your enemies, then launch a fireball to detonate it, then summon rain to put out the flames, then freeze or electrocute the sopping wet enemies still standing after the barrage. Battles are a cavalcade of glowing clouds and scorched earth and the key to victory is always countering — or exploiting — whatever elemental effects are lying around during your turn. The effects and their combinations are perfectly intuitive, making it an easy system to understand even if laying down the right combos in the heat of battle isn’t always so painless. Blood is as conductive as water, apparently, so make sure your front-line troops aren’t standing in the puddle when the sparks fly. Some frustration does creep in because, well, it’s turn-based, innit? It’s all very well lining up your favourite elemental combination when your team is up, but when the fight then proceeds with five or six enemies totally savaging you (and then summoning another two or three to savage you some more), there is nothing you can do but watch on in horror. Of course there are also more generically flashy magical effects to go along with your elemental fireworks. The most amusing thing is another echo back to the original Divinity. I complained about that first game’s difficulty curve, when in reality I managed to miss the starting dungeon that contained all the level-appropriate enemies. Guess what I did again? Hoooo yeah. There’s a mound in the middle of the Cyseal graveyard you can dig up that leads to a cave containing several convenient level 2 skeletons. You can get the rest of your levels from non-combat questing around the town, but you need to be pushing 5 before it’s really safe to go beyond the walls. The thing about tough fights is that your characters earn experience points independently of each other. While that perhaps makes sense in a competitive multiplayer environment, I’m not sure about co-op and it definitely gets frustrating in singleplayer — naturally your front-line tank is always the first one to go down, so he doesn’t get any experience points when the mage finishes off all the enemies before getting the chance to revive him. Then he falls behind the curve and the snowball is difficult (though thankfully not impossible) to arrest. There are also no trash mobs to farm up the tree; there is an absolutely finite amount of experience in the world, and it does feel like you need every single bit of it. Botching side quests will clear them out of your journal but you won’t get as big a reward as completing them properly. Conversational challenges are solved with games of rock/paper/scissors. These can happen between your two protagonists as often as against an NPC. That feeds into the realisation that there definitely is a golden path through the game, despite its apparent openness. Once I managed to catch up to the curve, the game really got into swing — combat encounters became challenging rather than horrifying, progress became smooth rather than stilted. Except then it happened again. The golden path is sometimes obscure, a bit like my experience with the original Tomb Raider — I tend to find the side quests and optional secrets while thinking that I’m heading down the obvious route, only to discover the main quest route is behind an obtuse set of traps more befitting an optional bonus. It can become slightly frustrating when the only progression appears to be straight through a fight two levels over your head, while the next piece of level-appropriate content is actually just around another corner. I guess that’s a perennial problem with RPGs, though. Levels and experience points gate content and the designer has to strike a balance between not letting the player get too far ahead of the curve by hoovering up asides and not letting them fall too far behind if they skip the extras. To be fair to Original Sin, a skillful command of magic can give you a hard-won victory against encounters that are a few notches above your pay-grade, but, well, I’m not that guy. Sorry, I don’t think walking off 3 action points is going to get you out of this one. 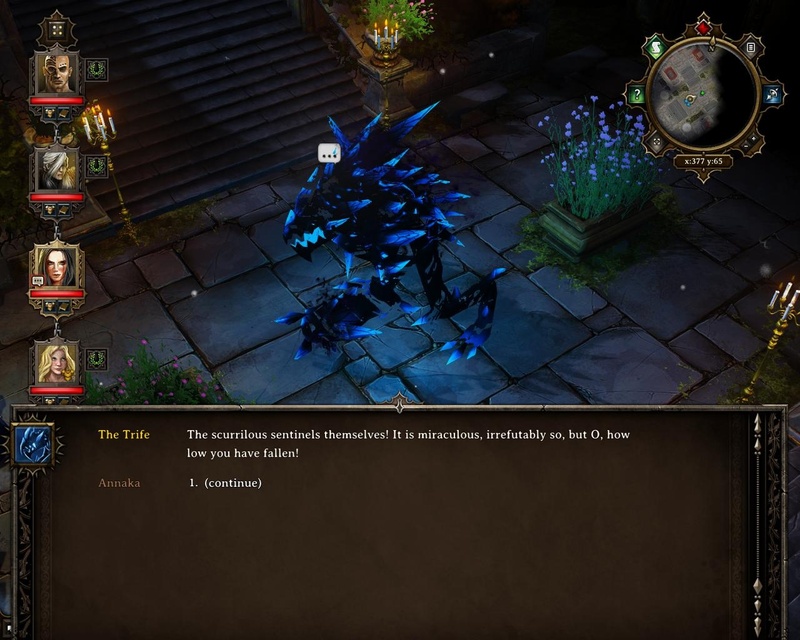 Of course it’s all done with Larian’s delectable wit and charm, and that makes it even more of shame that hitting the game from the wrong angle can turn you off. It is, of course, a testament to the quality of the world and the overall experience that the game is quite equipped to survive any missteps. As long as you can keep your feet on the golden path, though, all the goodness will enfold you in a warm embrace and you’ll keep finding yourself playing on far longer than you’d intended. Yes, one of my earliest acts in the game was to incite some drunks into attacking me and then mercilessly cut them down. But we felt bad afterwards, so +1 Compassionate! 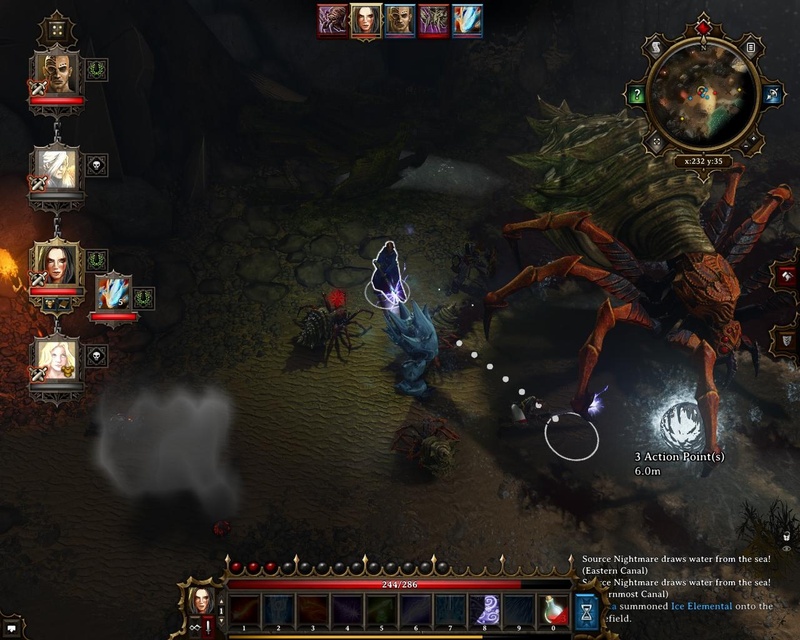 Ahhhh, but I grumble far too much — regardless of the gripes, Divinity: Original Sin is a joyous romp through a universe that continues to be delightful in its exuberance. The world is more than compelling enough to keep you going through any wobbly parts and when it really gets going it is, quite simply, tremendous fun. Congratulations crowd, you did the right thing. 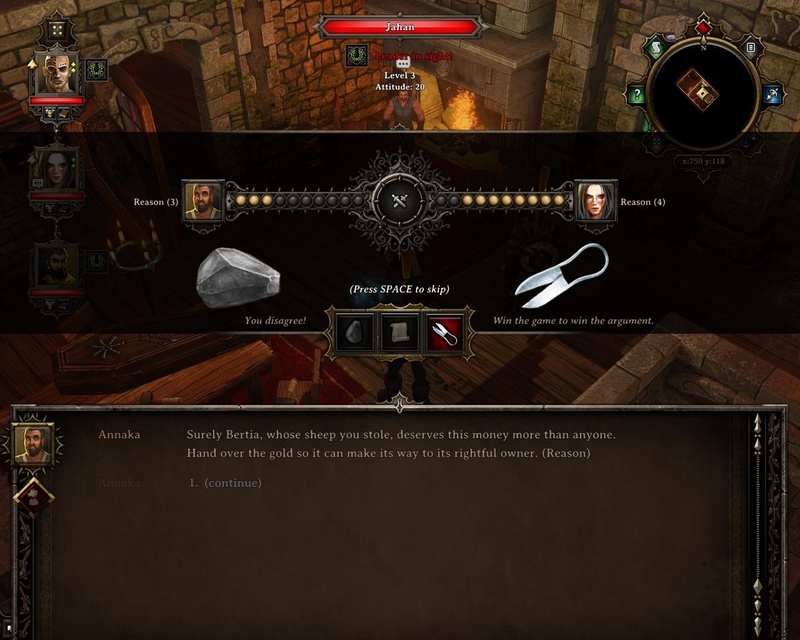 This entry was posted in Gaming and tagged Divinity, Divinity: Original Sin, Larian, late to the party, RPG, turn-based by Rao Dao Zao. Bookmark the permalink. The beginning is a bit annoying in this game. I did do the start dungeon, but you still need to do a lot of town quests to get strong enough to deal with those first monsters outside of town. But when you do get strong enough, you’re suddenly free to go where you want. I should probably continue with this game, but I never feel like it. I guess I just don’t really like the quest line that I’m at. I did feel a bit like that at the start too, it does take a wee while to take off. But once it does take off it’s really really good — like Morrowind, I’d encourage you to persevere.